I think we’ve all heard and are familiar with this quote, but what does it mean for your health and how you care for your body? A silly analogy that comes to mind is having a slow leak on a tire on your car. It may be fine today and you may be able to put a temporary patch on it but is it safe to drive at the cars optimal speeds or what it the patch wore off and the tire completely blew out while you were driving? You may cause an accident or get hurt by driving the car. Even though the other 3 tires were working just fine the car as a whole wasn’t able to perform as it was made to. We are given these beautifully and wonderfully made bodies by the almighty God. We are given all the tools we need to be healthy, strong, and thrive. Similar to the car, the engineer has provided the car with all the tools to perform as she was designed for. So why do we get sick? Why are people suffering from disease? Why do we get the unfortunate flat wheel? We live in a highly toxin, cancer stricken, and selfish world with the occasional nail in the road. There are some things that are out of our control, many in my opinion! There are also many things in our control. We can control the foods we choose to eat, the exercise we choose to do and the lifestyle we choose to live. However, we do not know the food we are eating is hurting us, that stress and lack of exercise is aging our bodies, and the life we thought we were supposed to live is not the life we were made to live. If we knew better, we would do better! I am here to tell you, there is a better way. I can help you make better food choices, strengthen your mind and body and change your lifestyle! Holistic health is your overall state of wellness on all levels of your being: physical, emotional, mental and spiritual. It encompasses the health of your entire being and extends to everyone and everything it affects you in any way. That includes your resources, your environment, and your relationships. At Queen of the Green each client receives support personalized to fit their individual needs! No one size fits all solution! We all have an abundance of fruit within ourselves to work with and no two pieces of fruit are the same. To me the journey to health is all about abundance, learning and growing! When we cleanse, nourish and balance ourselves we achieve vitality. Vitality, is essential to a happier more fulfilled life! I work with clients both near and far! In your home or on your phone! It’s more than an honor to be alongside you on your journey. Holistic living is a way to live your life balanced in all areas….Health, relationships, spirituality and finances to achieve a happier, healthier and more fulfilling life. 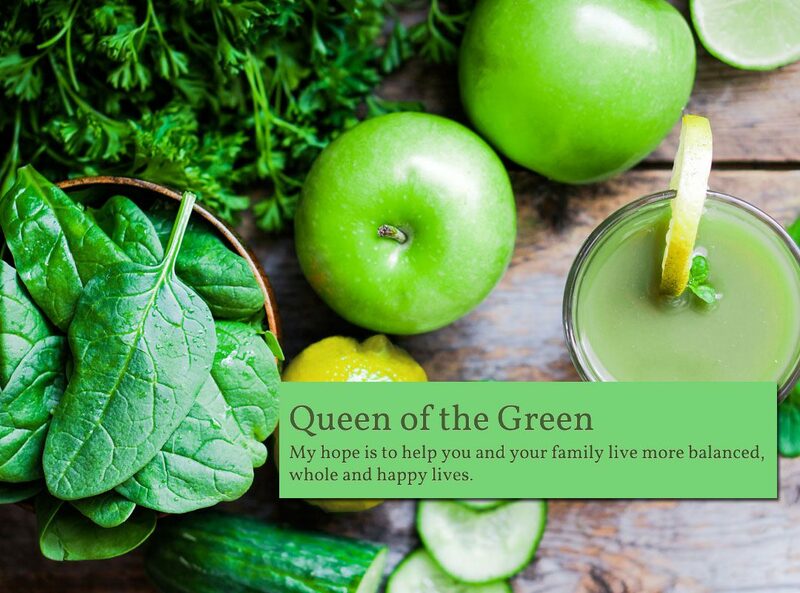 Holistic health at Queen of the Green offers your body the tools it needs to thrive! Next: Next post: Digestive Health and Bone Broth! Very interesting thanks for what you do. I totally know what you mean when they say ‘put a patch on it.’ knowing about total holistic health is so important. Thank you for the share!